For the inexperienced, certain elements of web design seem hard to grasp. What makes a great looking site? What makes a site that drives traffic? While you may feel overwhelmed at first, there is a science to designing successful websites — psychology! Since the internet became the predominant form of communication, people have been hard at work trying to understand the psychology of web design, how it can influence traffic and how you can make it work for you! You don’t need a degree to put this information to use. It may feel daunting, but a little knowledge of the basics can make a huge difference. Let this article guide you through the basic psychology of web design, and you’ll improve your traffic in no time! The information on your website is important, but how your share it matters too. Many sites overlook their content when implementing the psychology of web design. You want to ensure that your site visitors can access the information they want with as little stress as possible. Make sure that you write and edit your content so that visitors can easily find and understand the information. At the same time, don’t overwhelm your readers with too many unnecessary details. Keep your content in line with how you want visitors to perceive you or your organization. Often this means writing in a professional, but friendly, tone. This helps establish trust and authority, without becoming too dry or boring. This applies to pictures too! They might be worth a thousand words, but what message do those words share? Make sure that any imagery you use complements your content instead of detracting from it. Space isn’t just the final frontier, it also makes a huge difference in how visitors perceive your website. Just as you should edit your content to make it easy to understand, you should organize your content in such a way that visitors don’t have to seek and search for information. Further, if pictures, ads, icons, writing or other content cover every inch of screen space, visitors will not only find it difficult to glean any information from your site, they’ll also hate the experience. 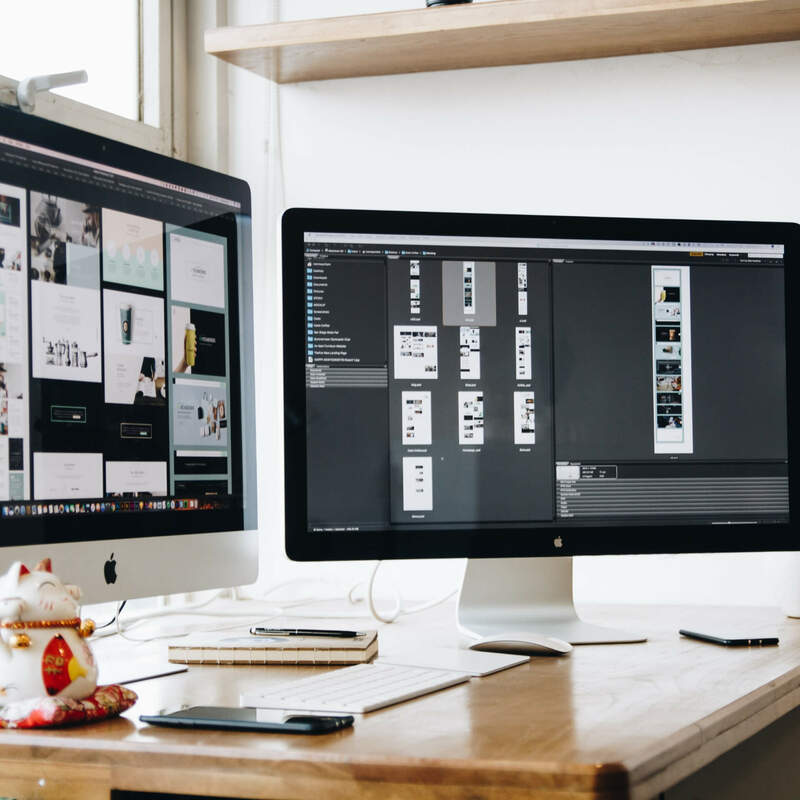 Instead of trying to cram visual elements or content into every nook and cranny, the psychology of web design suggests incorporating white space into your website. In these areas, no content or imagery demands attention; instead, the white space presents a visual resting place. Margins, spaces around images and breaking up long blocks of text all create a more positive reading experience for your visitor. So don’t feel like you must use every bit of screen space! Doing so will work against you. Trust the psychology of web design; effectively using white space will make your website look clean and well organized. Without realizing it, you may broadcast information about you and your website just by using a particular typeface! That’s right, fonts aren’t exempt from the psychology of web design either! Once upon a time, you had limited options when it came to typeface; you selected one of the few web-safe fonts and called it a day. Now the options seem limitless — so much so that you may have trouble choosing the right typeface for your website! If you find yourself feeling overwhelmed by the thousands of options available, keep in mind that generally typefaces will break down into two varieties; serif fonts and sans-serif fonts. Serif fonts have little feet — like Times New Roman — and tend to get used when it comes to professional sites and academic writing. News websites often use serif fonts to impart seriousness and authority. Sans-serif fonts lack those little feet — think of the Helvetica font — and they look less formal and a bit more modern. Frequently you will see tech companies and startups use sans-serif fonts to express a fresh, modern and even futuristic feeling. The colors used on a website may rely on an organization’s existing branding. Even so, you still have decisions to make, meaning you can still apply the psychology of web design. Whatever the main color of the branding or logo, there will likely be a neutral color used as well. Since the main color will likely be very dominant, consider taking up more space with the neutral color. Perhaps you can even use the neutral as the background color instead of white, although you will still adhere to the principles of white space. Beyond simply remaining consistent with brand identity, color plays a significant role in the psychology of web design. Color has a great influence on us and how we make decisions. Warm colors, like reds, yellows and oranges, exude friendliness and warmth. They make us feel creative and giving. When overused or overdone, however, they can make us feel stressed or even angry! Cool colors, like blues, purples and greens, can be just as inviting and relaxing. Often web designers use them to create a feeling of friendly professionalism. However, they can also come across as unwelcoming or unfriendly when used improperly. Keep in mind that these principles aren’t one-size-fits-all. What works great for one site won’t necessarily work well on another. Keep your target audience, end goal and organization in mind while making decisions about your website. Pair those thoughts with the psychology of web design and see what a difference it makes!